In the final decade of the twentieth century, the American West was at war. Battle lines had hardened, with environmentalists squarely on one side of the fence, and ranchers on the other. By the mid-1990s, debates over the region’s damaged land had devolved into political wrangling, bitter lawsuits, and even death-threats. Conventional wisdom told us those who wanted to work the land and those who wanted to protect it had fundamentally different—and irreconcilable—values. 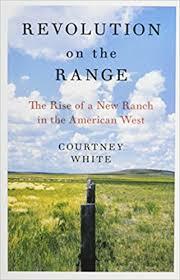 In Revolution on the Range, Courtney White challenges that truism, heralding stories from a new American West where cattle and conservation go hand in hand. He argues that ranchers and environmentalists have more in common than they’ve typically admitted: a love of wildlife, a deep respect for nature, and a strong allergic reaction to suburbanization. The real conflict has not been over ethics, but approaches. Today, a new brand of ranching is bridging the divide by mimicking nature while still turning a profit. Westerners are literally reinventing the ranch by confronting their own assumptions about nature, profitability, and each other. Ranchers are learning that new ideas can actually help preserve traditional lifestyles. Environmentalists are learning that protected landscapes aren’t always healthier than working ones. White, a self-proclaimed middle-class city boy, has learned there’s more to ranching than grit and cowboy boots. The author’s own transformation from conflict-oriented environmentalist to radical centrist mirrors the change sweeping the region. As ranchers and environmentalists find common cause, they’re discovering new ways to live on—and preserve—the land they both love. Revolution on the Range is the story of that journey, and a heartening vision of the new American West.